Less than 1% of professional baseball players are born in Massachusetts, yet you may be surprised to learn that two of the biggest names in baseball reside right here in the Bay State: Reebok and Nokona. Reebok is headquartered in Canton and is a producer of athletic footwear, apparel, and has a rapidly growing sports equipment line. Nokona is based out of Lexington and is a producer of gloves, bats and accessories. They are actually the only company that still manufactures baseball gloves in the United States. Two of the biggest baseball products in the game were developed by athletes within the Boston Amateur Baseball Network. John Byrne plays for the Boston White Sox in the Boston Mens Baseball League. Byrne helped oversee development of the Vector O baseball bat — you know, the bat with holes in the handle. 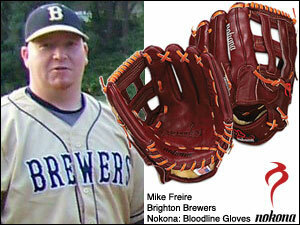 Mike Freire plays for the Brighton Brewers in the Yawkey League. He helped develop Nokona's Bloodline glove collection which leverages their proprietary Prime Leather. We caught up with these guys to see what they do, and how local amateur baseball has impacted their career — and how they've impacted ours. Q: What is your role in sports? 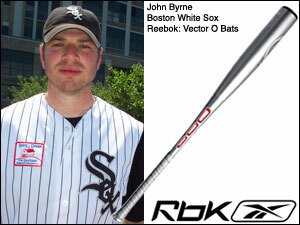 Byrne / Reebok: I'm the Product Development Manager for Reebok Baseball. My Job involves managing and developing the baseball/softball line. That's gloves, bats, catching gear, batting gloves, balls — by creating a concept and seeing it from an idea to the retail shelf. Freire / Nokona: I am the Director of Product Development for Nokona, designing baseball and fast pitch gloves and wood baseball bat models. I'm also the Sales Director for the New England region. Q: What role did your baseball skills play in getting you the job and on an ongoing basis? Byrne / Reebok: You need to have knowledge of the game and you have to know how to play the game. When I get samples in from the factory, I have to test the product myself before I know if it is good enough to take to a college team for field testing. The baseball knowledge and familiarity with the baseball lingo allows me to understand player feedback and go back to the lab to tweak the product. Freire / Nokona: A great deal, actually. I was initially brought on board to manage the sales here in New England, utilizing the network that I've coincidentally created by being a part of our little baseball community for many years. While in sales, and because of my baseball background, I was offered to input some ideas on how to build upon our "American Made" tradition of quality and improve it. They let me run with it, and the "Nokona Bloodline" glove collection was born. Q: What is the best part about working professionally in baseball? Byrne / Reebok: I get to stay in active in the game at all levels, youth to MLB. Its the next best thing to getting drafted. Freire / Nokona: There are many great things. But I would say that just being involved in the game from the time you wake up until the time you go to bed is pretty cool. Q: What is the biggest challenge about working in baseball? Byrne / Reebok: The biggest challenge for me is realizing that this is my Job. Being constantly around the game, you have to stay out of the batting cage and off the field to get some work done. Freire / Nokona: The biggest challenge for me is to continually come up with ideas that work. Being different from our competitors for the sake of being different will get us nowhere. You have to be creative. But that creativity must translate into functionability on the diamond. Q: What are the details of a project that you worked on that would make your teammates jealous? Byrne / Reebok: Part of my responsibilities involve creating gloves and equipment for Major League players. It's very exciting to work with those guys, but what we are most proud of is the new Vector O baseball bat. Check it out and yes those are holes in the handles. Less Drag + faster swing speeds = more distances. We have done some wind tunnel testing that proved we have less drag then our competitors. We have signed 24 colleges to swing it this season. Freire / Nokona: Definitely the Bloodline glove. I was given an opportunity to basically create a glove from scratch, adding features that I always wished MY gloves would have had over the years. I also had the luxury of consulting with professional players from all positions to get their insight on what makes a glove great, and it can differ from position to position. The Bloodline is the first glove ever to be custom tanned to suit each position. In other words, each Bloodline glove has it's own unique qualities and characteristics in the leather. A second baseman's glove, for instance, is triple tanned and vacuum dried for rigidity and firmness, while the outfielder's pattern is double tanned for a softer, less rigid feel. Some gloves feature Kangaroo leather on the back to lighten the glove, etc. Q: What other tidbits of what you do would be neat to share with the Boston Amateur Baseball Network? Byrne / Reebok: Product Development means that you will travel a lot. All of my products are made in Asia, so I usually head over there at least two times a year for 2-3 weeks at a time. When I get samples back from factories I head out to colleges all over the nation to workout with teams. They test product and provide valuable feedback. Learn more about the Reebok Vector O baseball bat. Learn more about the Nokona Bloodline glove line. Thanks John and Mike, and keep up the good work!